For the first time ever there will be three Frenchmen competing in the third round of the Men’s World Squash Championship after World No.36 Gregoire Marche came through his second round encounter in Bellevue, Washington to join compatriots Gregory Gaultier and Mathieu Castagnet in the least 16. 25-year-old Marche recorded one of the biggest wins of his career as he bested World No.15 Stephen Coppinger after a gruelling 88 minute battle at the Meydenbauer Centre to secure his place in the third round for the first time in his career and create history for French squash. “I have been waiting a long time for this kind of significant victory and what a time to do it, here at the biggest tournament,” said Marche. “I arrived here in a poor shape and feeling a bit sick and struggling with jetlag. But today I was feeling really good on the court thanks to the work the French team here have down with me this tournament. Marche will now face Tarek Momen in the third round after the Egyptian ended the surge of Peruvian World Junior Champion Diego Elias while 2014 World Champion Ramy Ashour continued the defence of his crown with a polished victory over Mohamed Abouelghar. 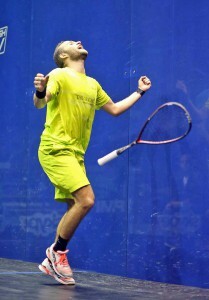 Ashour took just 37-minutes to overcome the 22-year-old in straight-games on a day that also saw World No.2 Nick Matthew move comfortably into the next round with victory over Karim El Hammamy while Egyptian trio Omar Mosaad, Marwan Elshorbagy and Karim Abdel Gawad also triumphed. “I’m pleased with the way I played today and hopefully I can just keep it going now,” said Ashour.